Society at large may be trying to better grapple with issues of sexual and domestic abuse, but Americans certainly aren’t looking to the White House for guidance on these subjects. That’s with good reason – it turns out the Trump administration has been harboring a high-ranking official facing multiple domestic violence allegations. On Wednesday, Rob Porter resigned from his White House job in the wake of these accusations going public, despite labeling the charges “simply false.” As staff secretary, Porter had the extremely important job of deciding which documents wind up on the president’s desk for his input. The domestic violence accusations come from Porter’s two ex-wives, who described terrifying levels of abuse. Both former spouses offered up some form of proof, as well. Jennifer Willoughby disclosed an emergency protective order against Porter, while Colbie showed old photos of her with a black eye. If it seems to you like maybe Kelly doesn’t actually care about Porter’s alleged history of domestic violence, you may be on to something. It turns out that Kelly has known about these allegations for months and ignored and perhaps even helped to cover up their severity. 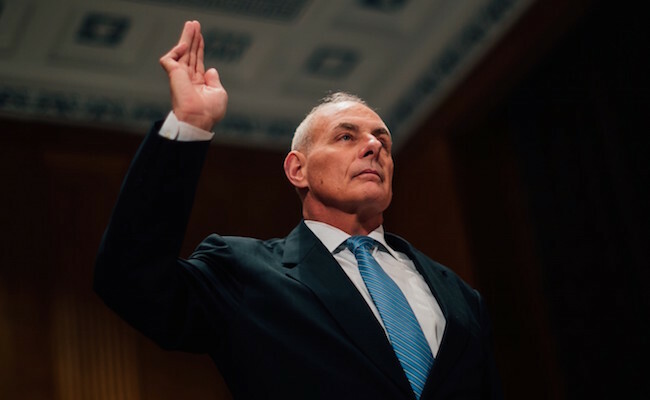 At the very least, Kelly seemed to have no problem with keeping a man of this character on staff at a very high level, and was even encouraging him to stay on after the news broke. We know that the FBI had objections and reported them to Kelly and the Trump administration. The agency would not issue permanent security clearance to Porter because of his past violence, but the White House still allowed him to have access to sensitive information anyway. Apparently, Jared Kushner’s not the only one to be afforded this inappropriate courtesy. It’s more troubling when you realize that White House Communications Director Hope Hicks has been in a romantic relationship with Porter. Shouldn’t Kelly have an obligation to make sure Hicks knows about the situation for her own safety? While it’s not clear whether Hicks knew about the domestic violence accusations in advance, she was tasked with helping to compose the first statement supporting him this past week. Of course, what can we expect from an administration led by a man who faces over a dozen allegation of sexual assault himself and who was caught bragging on tape about groping women? The fact that the White House did not consider Porter’s past disqualifying says a lot about the boy’s club mentality that prevails in the West Wing. It’s time for both abusers and those who protect them to be held accountable. Please sign this Care2 petition demanding that Trump fire Chief of Staff John Kelly for protecting known abuser Rob Porter.